I finished the purple shawl I was knitting. It was actually done on Monday night but I didn't get a chance to take photos and write about it until today. We are receiving A LOT of snow today so it's a good day to stay inside and wrap up in a shawl. 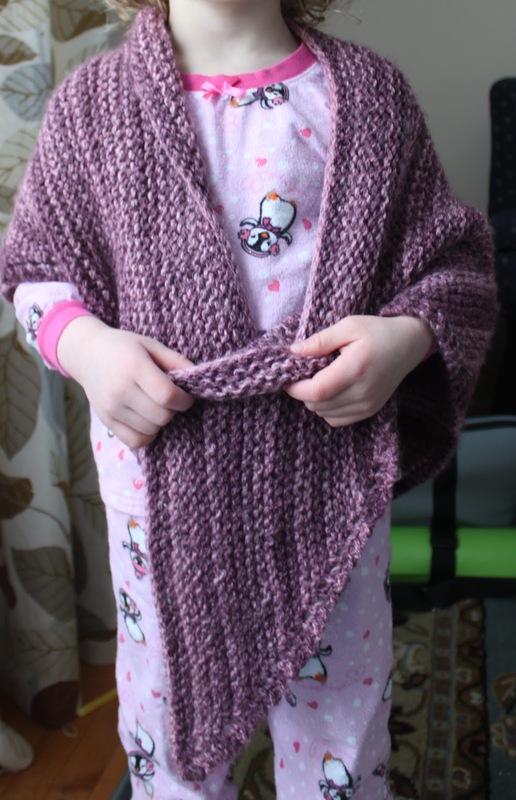 It turns out the shawl was not really big enough for me but it's perfect for a four-year-old. My daughter and I are having a pajamma day today. We both just changed from last night's p.j. 's into a fresh pair. The pink flannel and penguins offset the shawl nicely don't you think? ;) I have been busy crafting all day on things for my son's birthday party on Saturday. I'll probably have pictures of those items to show on Saturday. In the meantime, here is the shawl from the back. This shawl is actually a simple dish cloth pattern made huge. You cast on four stitches. Knit two rows. Then you knit 2, yarn over 1 and knit to the end. You keep doing this until the shawl is the size you want and then you bind off. It's knit using a round as it gets too large to keep on regular needles. I believe my needles are 6.5 mm. I used "Marbles" yarn. I had one large ball of the purple. I don't have the ball band anymore though so I can't give anymore details than that. Ravelled here.